John Farley, an experimental test pilot heavily involved in the development of the Hawker Siddeley P.1127 and British Aerospace (BAe now BAE Systems) Harrier, died on June 13 at the age of 85. Farley was born April 17, 1933 in Hastings, East Sussex. Upon graduating from King's College in Hastings in 1950, he joined the Royal Aircraft Establishment (RAE) at Farnborough as a student apprentice. This allowed him to fly as a flight test observer on numerous programs. Farley joined the RAF in 1958 and, in 1963, was selected for the Empire Test Pilots' School at Farnborough. He subsequently joined the Aerodynamics Research Flight at RAE Bedford and was introduced to the P.1127 in 1964; this led to his long association with Dunsfold Aerodrome (then operated by Hawker), resulting in 19 years of Harrier test flying. He joined Hawker Aviation as a company test pilot in 1967 following his service in the RAF, leading to him be appointed Hawker Deputy Chief Test Pilot in 1971 and BAe Chief Test Pilot in 1978. In this capacity, he began work on the development of the Sea Harrier, and was the first pilot to undertake a takeoff with the aid of the ski-jump. One particularly challenging aspect of the test flying program on the Harrier revolved around intake momentum drag yaw, when a crosswind into an engine inlet could lead to a state of uncontrolled roll. Farley was involved in the conversion course of the first two US Marine Corps pilots to the Harrier in 1967, which at that time had neither a two-seat version nor a simulator available. He continued this association with the USMC, and spent increasing amounts of time in the US, particularly in the early 1980s during the development of the AV-8B Harrier II. 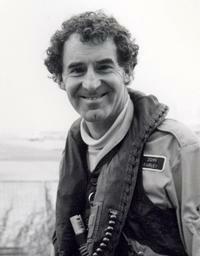 Farley had to retire from test flying in 1983 on his 50th birthday. He subsequently became Manager of Dunsfold Aerodrome for BAe until 1990. Farley then became a freelance pilot through 1999, as well as a visiting lecturer at several universities. In 1995, he started summer school courses for 16- to 18-year-old students to encourage them to become engineers in the aerospace business and ran the Schools Aerospace Challenge and International Aerospace Summer School, both held at Cranfield University. He was elected President of the Association of Aerospace Universities, in 2009. A highly articulate writer, he was also a regular and enthusiastic contributor to Flyer magazine; his autobiography, A View from the Hover — My Life in Aviation, was published in 2008. During his aviation career, Farley flew more than 80 different types of aircraft and was the first western pilot to fly the Mikoyan MiG-29 in 1990. He was a renowned Harrier display pilot, and later an advisor to Lockheed Martin on the F-35 program. For his efforts, Farley received an Air Force Cross and the Queen's Commendation for Valuable Service in the Air in 1970, and he was made an Officer of the Most Excellent Order of the British Empire (OBE, one level higher than “MBE”) in 1980. He was also granted honorary doctoral degrees in technology (2001) and engineering (Kingston University, 2008).